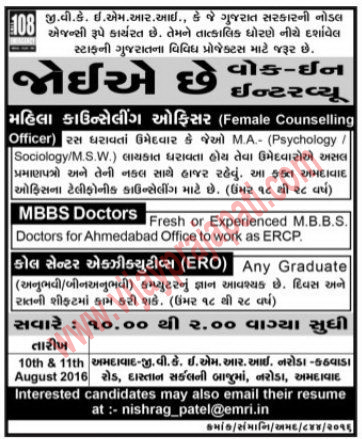 GVK EMRI (Emergency Management & Research Institute) published Walk in Interview notification for recruitment for Doctor, ERO & Female Counselling posts at various centre in Gujarat. For more details about this recruitment e. g. qualification, age limit, selection procedure, how to apply as under. You can view official notification by following link. How to apply: Eligible candidates may attend walk in interview along with application to given below address.